At Evolution Hospitality we care about our people and are committed to helping them realize their full potential, knowing that the needs of the company are best met by meeting the needs of our people. We think that when you feel good about yourself, you are in a great position to demonstrate our Values and Guiding Principles. To this goal we have worked with several physicians, yoga experts, nutritionists and transcendental meditation experts to guide our teams to better personal health and wellness. But when Dr. Romie Mushtaq, M.D., ABIHM, presented a session at Evo’s 2016 annual meeting it was mutual love at first sight. Eyes locked on Dr. Romie and we knew we needed more of what she was promoting… much, much, more. Dr. Romie was equally inspired by Evo’s Wellness Triangle, which promotes healthier living by balancing sleep, work, nutrition, movement, creativity and community. Since that fateful meeting Dr. Romie has become our wellness advisor and guiding light to living a healthier, less stressful life filled with gratitude, compassion and mindfulness. Dr. Romie is a traditionally trained neurologist with additional board certification in integrative medicine. She completed her medical training at the Medical University of South Carolina, University of Pittsburgh Medical Center and the University of Michigan. Dr. Romie has been helping professionals heal by combining brain health, psychology and mindfulness. “Meditation is medicine for the mind” is one of Dr. Romie’s healing principles. Dr. Romie has the ability to break down her recommended prescription for healthier living into tiny bite-size pieces, easily digestible and even more easily implemented. She blends brain science, and mindful terms with sassy and soulful humor for an engaging and insightful vision into her healthy living plans. Treating individuals as a whole is Dr. Romie’s mission: her counseling incorporates ways to eat for health, sleep peacefully, improve mood, and build better relationships. There is nothing quite like hearing Dr. Romie speak of her personal journey to this realization – a trip that started after life-saving surgery. 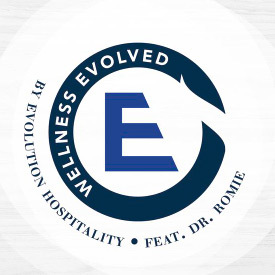 Evolution associates are lucky enough to experience regular, personal visits from Dr. Romie, encouraging them on their path to healthier living. For a daily dose of Dr. Romie connect by clicking the links below.